IAR: It started in 1949, when I started writing for newspapers and became a member of the Civil Liberties Union. Actually, even as a child, I had been exposed to civil rights because I came from a family that believed in upholding rights of peasants and working people. In this sense, I think I was a human rights activist all my conscious life. I had particularly developed a strong opposition to feudalism and I very much stood for land reforms. In fact, my first articles called for abolishing feudalism. You say you were firm a family stood for civil rights. Tell us a little bit more about your family? We were small landholders. My father and grandfather had some land in Haryana. And my father was both a religious person and a secular person. There was no religious prejudice in my life. In fact, I did not know the difference between Hindus and Muslims until I went to high school. My father was a lawyer, and he had a large number of Hindu clients and friends from the Communist Party. Many times, I would watch my father playing bridge with his friends and in hearing their conversations, I too absorbed the ideas of equality and fraternity. You say that your father was religious and secular both? How was that possible? The majority of Muslim leaders in India, Abul Kalam Azad, Hasrat Mohani for instance, were staunch Muslims whilst being completely secular also. This tradition existed because at that time it was believed that Islam did not prescribe a political system except for requiring Muslims to resolve their issues through mutual consultation. There was a great deal of discussion on Islamic issues at that time. Now there is no discussion, there are only rulings. You started off as a journalist. At what point did your writing transform into action? Even as a journalist I had joined the Journalist Trade Union and started interacting with labour leaders. The atmosphere at the Pakistan Times where I worked, was also very charged. However, as a journalist I believed in remaining completely independent. I only actively started engaging with human rights work in 1985 when Asma [Jahangir] organised a convention in Lahore where we took the decision to establish the Human Rights Commission of Pakistan (HRCP). How did you know Asma? I had met her while I was working at Viewpoint magazine whose offices were a meeting place for people from a wide range of backgrounds. Asma was amongst the regular visitors. I also had a slight acquaintance with Asma’s father and I had met her at his house also. Later she became a lawyer and a member of the Women Action Forum. Around 1982-83 the Forum granted me honorary womanhood, so, I used to attend their meetings. So, how did you conceive the idea of the HRCP (Human Rights Commission Pakistan)? The idea was Asma’s. One day I was working at my office when Asma came over and standing in the doorway, she said, ‘Rehman Sahib, Let’s form a Human Rights Commission’. So, I said, ‘Ok, go ahead’. And she later complained that I did not even look up. I had agreed because my theory was that whilst most of these ideas come to nothing it was possible that one or two things, like the HRCP, may well work out. What did you expect the HRCP to achieve? Actually, there were two things: despite the extensive censorship in the Zia’s martial law, small indigenous associations had come up, mainly to help political prisoners. HRCP’s first mandate was to represent and connect these associations and its second agenda was to fight against illegal detention and to agitate for the basic right to life, liberty and security. We adopted three resolutions at the founding convention: to demand elections, which Zia had been postponing, to abolish separate electorates for minorities and the death penalty. Our core focus was on defending and promoting the rights of all citizens of Pakistan, to promote rule of law, to promote democratic government and to collaborate with like-minded organisations at home and abroad. (L-R) SAC Director Dr Mukulika Banerjee, Ibn Abdur Rehman, Amber Darr and Amartya Sen discuss Asma Jahangir’s life and legacy. Photo credit: Rebecca Bowers, South Asia Centre. What in your view is the real success of the HRCP? The HRCP’s biggest achievement is raising consciousness. I remember when we would ask people to join HRCP, even lawyers would say: ‘you want us to work for human rights? Are we human?’ They had been so dehumanised by the military regime that they had become cynical. Now nobody says such things. HRCP also played a very important role in resisting extremism in the country. Asma led many processions against religious profiling of persons in national identity cards and was successful in preventing it. We were also able to have thousands of people released from bonded labour. In fact, many bonded labourers realised that they could win their own freedom. Separate electorates were largely abolished in 2002. The Ahmadi issue persists of course. Going forward, what is the one thing that you would like to focus on for human rights in Pakistan? I would like to work on extremism. While the view that Pakistan was created in the name of religion has been strongly contested the state has adopted this view which has led to a tussle between different religious sects in the country. Some claimed power because they were more numerous, others because they had money and weapons. At the time of its creation, People transferred their loyalties, their identities to Pakistan. My personal view is that Pakistan did not deliver, so people regressed to their provincial loyalties. When even those did not deliver, people started regressing to their ethnic and tribal affiliations. This is what atomisation is. Ultimately only your family matters, and then there is fighting within the family also. It is easy for a situation to deteriorate but to repair deterioration takes longer. It will take quite some time — maybe a generation or a generation and a half — to undo all this. A large number of people in Pakistan believe that the root cause of our waywardness is our lack of education and our divisive curriculum. And there is a strange pride that we are the best, even when we are not. This needs to be changed. We have been trying for this for the last ten years. But the mullahs are very organised in resisting any change. How can mullah power be contained? That is only possible through intra-religious discourse which is presently missing in Pakistan. The public space and educational space is left in the hands of the most conservative clerics. There is a lot of work going on throughout the world on liberal Islam but not in Pakistan. Any book that presents an alternate view of religion and the state is prevented from entering Pakistan. 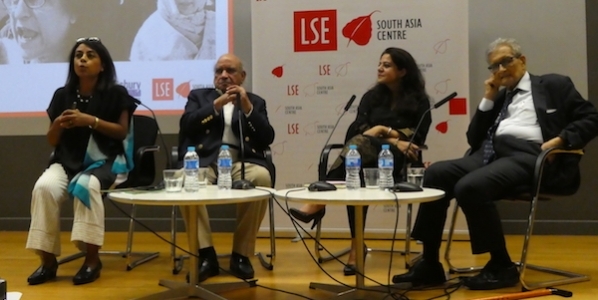 How do see the future of South Asia given the polarity between India and Pakistan today? There is a saying in Muslims, people adopt the religion of their rulers. The confrontations in South Asia are state driven. Once you start off on that road it creates vested interests and then these interests lead and drive the people. If the state starts to see sense, then people will follow. But I think this will take time. Ibn Abdur Rehmann is a peace and human rights advocate. He is a recipient of the International Nuremberg Human Rights Award in 2003, and of the Ramon Magsaysay Award for Peace and International Understanding in 2004. Amber Darr holds a PhD in Law from University College London, whee she is a teaching fellow and a Senior Research Fellow at the UCL Centre for Law, Economics and Society. She is also an Advocate of the Supreme Court of Pakistan.